I am going to cut right to the chase here today, as I have been wading through 35 pages of information on thread! Yes 35 pages! I understand, Wow! So I am going to give you some things you will likely want to print out and keep. I am so excited to be able to share with all of you this information! I am first going to be discussing thread weight. Weight is actually a length measurement. As I talked about before thread comes in various weights, the most commonly used are 30wt, 40 wt, and 50 wt. The smaller the number, the heavier the thread is. The most commonly used for Embroidery is 40 wt. If the designs are too dense you can try using a lighter 50 wt. thread. Bobbin threads are usually finer and often are a 60 wt thread. It also comes in three different measurements, those being, Weight, Denier Weight, and Tex. Weight. Weight: is as described above, the smaller the number the heavier the thread. Denier Weight: (in grams) A larger number indicates heavier thread. Comparative note here: that a 40 wt. thread is approximately equal to 240 Denier. Tex Weight: (in grams), of 1000 meters of thread. Comparative note here: 40 wt. = 240 Denier = Tex 25. Alrighty then, now is everyone totally confused? I hope this is easy for you all to understand, I tried to simplify it as much as possible. Most computerized embroidery designs are digitized for 40 wt. rayon thread, and this does not mean you have to use that type of thread specifically. There are many times when a different weight or type of thread will be more suitable for your needs. There are times when you may want to use both a 30 and 40 weight thread in a design. If you have a large fill area, and you are using a light colored thread on a dark fabric, you may want to consider using 30 wt because it will have better coverage. On smaller sections a 40 wt would be more appropriate. If you have a re-sizing software and increase the size of the design, you may be happier with the results using a 30 wt as it is thicker and will give you better coverage on a now larger area. It may also be necessary to reduce the tension of your machine as it is a more dense thread. Rayon: is a synthetic fiber, has great sheen, is soft, relatively heat resistant, and is the standard for machine embroidery. The thing to remember with rayon is that it is not colorfast,not as durable as poly and not as strong as poly. Polyester: is produced by pressing polymer resins through small holes and solidifying in the form of filaments. It is colorfast,has more tensile strength than rayon, retains its shape better, and recovers stretch.Not as shiny as rayon but is much more durable and would be used for items that are to be laundered many times. Metallics: are made of thin, flat ribbon like fibers that is metalized with aluminum. They do not provide good coverage and are not as resilient. They can fray and break(as many of you know). Glazed thread: is thread put through a process to create a glossy, high luster finish. It is not recommended for ME. Mercerized Thread: is thread that has been through a process treated in a caustic solution under controlled tension,that cause the fibers to swell. It also adds luster and strength. Nylon: is a synthetic, and is most commonly used in the form as a monofilament clear thread or as a textured fuzzy thread. It is not heat resistant,or colorfast, has a low melting temperature, and becomes brittle after laundering.It is also considered a general purpose thread along with cotton, and a cotton wrapped polyester. 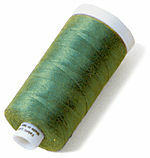 Silk: thread absorbs dye more brilliantly than any other fiber, and is really the top of the line in specialty threads. It sews without breaking,has strength of a poly,while having the stability of cotton. It has a distinct sheen to it the cannot be matched by any other thread, coming in 30 to 50 wts. and a wide variety of colors. It is also very expensive, but may be worth considering for formal wear, such as a bridal gown. Tensile Strength, a quick test for you to do to evaluate the strength of different embroidery threads is to ask for someone to help you,suspend a piece of thread, then using a second piece of the same thread saw back and forth along the first. Look to see how much abuse the thread takes before breaking. Elongation, is the amount of stretch a thread has. In other words pull on it to see how much it can stretch before breaking. Too much elasticity can cause puckering, and too little can cause it to break. 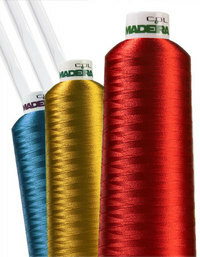 Sheen, is the color saturation and the luster of the thread. thread looks different on the spool than it does on the design. Compare stitch outs with different threads for the best evaluation of a certain product. Remember also that the higher the quality of thread, the less special handling will be necessary and less breakage and waste. Look for a guarantee, if you are not satisfies with a thread can you return it? Make sure the thread you have selected is intended for your application. Ask yourself some basic questions when buying, such as, what fabric am I using,what is the content and the weight of the thread,what needle type and size should I use,what stabilizer, and do I need to adjust the tension of my machine? Each type and brand of thread has specific characteristics and will behave differently. Now looking at the thread, cones, and spools, check for uniform wind. Lack of uniformity results from improper winding and can indicate damaged threads. 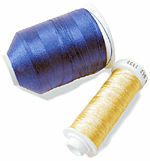 Look for uniform color, any non standard appearance is caused from too high winding tensions and the thread is damaged. Look for bruises and flat spots,damage can occur in handling and will result in breaks. It can be defective because of improper construction, in this case, either return it to where you purchased it or toss it. It can cause severe damage to your machine and Will save you a lot of headaches. Now last but not least, do not store metallic threads with adhesive tape to prevent unwinding, It can rub off onto the thread then accumulate in the tension disks of your machine and the eye of the needle. This can result in severe machine damage as well. I do also recommend a thread delivery system like the Thread Pilot, as the trend for the future is larger thread spools. This is because of the savings to you. A lot of the cost on a spool of thread is the winding process, so the larger the spool, the bigger the savings. Thread stands help to alleviate the issue of delivery. Larger spools do not work well on a vertical pin delivery, as they are much too heavy and put too much "drag" on the thread and prevents smooth rotation. It also lifts the thread to a higher position which helps facilitate an even feed without added tension. Thread on a king or mini king spool is cross wound and putting it on a thread stand is beneficial in its delivery, as cross wound thread is meant to come off the top of the spool while sitting flat on the on the thread stand. Thread stands work well as they can accommodate any size spool, and often come with adapters to perform this function. 5,M cone= approx. 1,250,000 MM stitches. The average length of an embroidery stitch is approx. 3 millimeters. A 1,000 M cone= approx. 250,000 MM stitches. I hope this will help you in determining how much. To me, I just buy an extra spool, I will use is at some point! Next, we get into the bobbins,which also come in different weights, the most common among those is 50wt and 60wt. There are two types of bobbins, L size and M size. Over 75% of home machines use the L size bobbins. The trend is shifting so that home machines are becoming more compatible as far as bobbins are concerned. The M size is a larger bobbin used in some long arm machines. Now comes the question of whether you should use pre-wound or wind your own? It is personal preference. However it has been proved time over, that the pre-wound tend to have more thread on them than you can wind yourself. If I was doing this for a business, I would defiantly go with pre-wound, for the ease of use. The cost isn't that great on them verses ones you wind yourself. The down side is matching color with the top threads. Bobbins do come in colors now but they are very expensive in relation to self wound. Plastic? Or Paper? No, this is not the grocery store! Bobbins come in plastic or cardboard. Again, personal preference and machine type. Some say that the plastic sided ones are so smooth that they may continue to spin even after your machine stops and can cause backlash.some machines seem to work better with cardboard sided as the cardboard sides provide more friction and backlash is not a problem. If it is then the tension may need to be tightened. Polyester or cotton bobbins, which should you use? Again, that is personal preference, keep in mind though that cotton does throw off quite a lot of lint and usually requires more diligent cleaning routine than using polyester. They have little or no lint to them. As far as someones saying that you can not use them because your dealer told you not to, or someone said it will void your warranty, not true! Almost every major manufacturer sells pre-wound bobbins. Cotton bobbins are the ones that most quilters go for as it keeps the fiber content consistent with the fabric, batting, and top thread. For embroidery, it is ok but on dense fill designs it will result in a stiff design. Polyester or spun-poly and cotton wrapped poly, are stronger than cotton. A lot of people like it for its strength. The issue is that it does not have a slick surface and can grab the top thread too tight creating uneven stitches and breakage. Filament poly is thin and lightweight, yet strong. Embroiderers like it as it creates a soft backing, even on dense fills. Unfortunately, the bobbin is not always considered a factor when trying to find answers to thread issues. It is widely known that there are fewer problems with bobbin thread than with top threads. Thread breaks: can be cause by many things, the most common being a burr on your needle, in the needle eye itself, tension, bent needle, lint buildup, incorrect digitizing causing design to be too dense in a fill area, thick fabrics, pooling of thread that causes portions of the spool to wind off improperly. Thread Pileups: on the back of the fabric is caused when tension adjustment is needed. Stitching not following the pattern: are caused by bent needles,loose hoop in the frame. Flat Stitching: is caused from tension tightness, use a topping film on fabrics with a pile such as towels. Looping: is cause by needing a tension adjustment for tight fabric weaves, or has been digitized with too many stitches. Skipped Stitches: are caused by using the wrong bobbin or incorrect needle size. Puckering: is caused from having the tension too tight, having the backing not hooped with the same tension as the fabric, fabric is hooped too tightly, needles are not sharp enough, density of the design is too thick and needs to be increased in size a little bit. Whew! Alright now, I am giving a test on Monday so you better print this one off! Just kidding! I don't expect anyone to remember all of this so I hope you will print it off so you will have it for future reference. So that's it for me until next time! As Always.....................Happy Stitchin'! Remember to K.I.S.S someone close to you today! Suzy's Tip Of The Week! : When sewing like items or multiple items such as quilt squares, sew all of them on one side, leaving a 1/2" or so of thread between them. When done, go through and clip them, stack them accordingly, then go through and sew all of the other side doing the same thing. Big time saver! Just follow throughout the entire square, then stack according to your quilt layout. By doing this, you are saving the time it would take you to cut each piece separately. Once you get the hang of doing this, you will each figure out which stacking method works best for you. Good Luck! Take care until the next time folks, Happy Fall! For those of you who would like to help the Wee Care Program, here is a link that will take you to information about them as well as some patterns for the little clothes. Photo's courtesy of Madeira,Mettler,Isafil,Sulky,Guttermann official web sites. Everything you always wanted to know about thread but was afraid to ask !!!! Whew! Will be printing and filing this for future reference. I have learned so much by reading the blogs & forums! I bought my Babylock Emore' last Dec. however; I am ahead of my classes. I have sewn for years but here & there. It is one of my passions but am limited b/c of health issues. Would love to just get to sew, quilt & embroidery w/o ever getting too tired. We ME'ers really need you to keep up the good job! That was my hope when researching this project for the blog is to have something that everyone could keep handy! I also learned a few things I didn't know so it was good for me to do this! It pays to keep up on all the new stuff! I so understand how you feel ! I am also disabled. Sometimes my medicine makes me very sleepy and tired. I had one day I fell asleep at my machine, but was abruptly awakened when my head hit the top of the machine! LOL, I have also fell asleep at the computer! I woke up and I had my head on the keyboard! Poor google didn't know what to do! Ha! I will do my best for you DJ! Is there anything in particular that you would like to read about? Let me hear your ideas! Take Care, it is folks like you that warm my heart! Just as with needles, it makes my head swim to try to absorb all the information you gave us on thread, etc. Also, it's kinda like going to a quilt shop and seeing all the fabrics, or clicking through the thousands of ME designs. I can't see the forest for the trees! Thanks for the great information. Maybe some of it will stick. Wow... I know I have read this stuff somewhere before but it still amazes me how much we have to know just to have a little fun. Thank you for putting all this together to make learning easier. You did it again! A blog that's so full of pertinant information. Thread & needles are subjects that fall into the catagory of "i didn't know what I didn't know, so I didn't know what to ask!" Thanks to you, Pat & the rest of the bloggers, I'm on my way to knowing what I need! Thank you Pat, Rosie, Sherry and LaRue! I try my best to bring as much information as possible! Yes, I agree we have to know a lot of things, just to have a little fun! Just a note to all the friends out there, I am coming to you today live from New Orleans! We pulled in early yesterday afternoon and of course made our way to Bourbon Street right away! First time I have been here and I must say that it definatly has Flavor here! Last evening we enjoyed seeing all the excitement of the atmosphere around us,then enjoyed some of New Orleans cuisine,I had a Po'Boy, that was both delicious and wonderfully spicy! We also enjoyed some of the best jazz I have heard in a very long time! It is a unique and wonderful place. So, if you don't see a response right away,I will get to it as soon as we can drag ourselves back to get onto the computer. Today we are going to see some of the sites,take a horse drawn tour, and as much as we can fit into the day. Tomorrow we are on our way across the country to Texas! Only a couple of you know the real reason why,but it is a surprise so I am not going to let the cat out of the bag just yet! Great article! This cleared up many questions I had. This is definitely one I'll refer to often. First I would like to Thank you all for your wonderful comments and e-mails! While we have limited internet services, we are having issues with sending any e-mails from here,so if you have sent me an e-mail I will answer it as soon as we have that available to us. We made it to my brother's place in Texas, and it seems good to see them. I realized that I haven't seen him for at least 5 years! My other brother got in last night ans we will see them tonight for dinner. I am looking forward to it as they are both really crazy and usually end up making my ribs sore from the laughter! Again, Thanks for all your lovely comments and e-mails. I will certainly answer each one personally as soon as I can! I will keep you posted on the happenings as we progress the trip! Hey Judy - what a great blog! I've been slowly working my way through from the begonning and am learning so much! I love all the technical stuff because I want to understand the "why" of things!! I know - I'm a bit of a nerd! sometimes. I will definitely be printing this out and filing it in my notebook of tip sheets. I "retired" last year do to health issues, and know what you mean by falling asleep at the computer! I was starting to do that at work. Since I was an Illustrator and Designer, on the computer, that wasn't too good. Now that I can set my own hours, I'm doing better. But I need to learn when to stop sometimes! I stay so busy that I can't imagine how I got anything done while I worked fuul time away from home. So thanks again for the great info on your blog. I'm learning so much. Thank you so much for your kind words. I am also a bit of a nerd too, I not only want to know the why of things but I also want to know how it works. I am so pleased that all of the blogs are so useful to you, and that is why we do them, to share everything we know with this very large and wonderful community. I am also elated that everyone at Ann The Gran, is so willing to help all of the bloggers to create wonderful information for you to keep. I so love hearing all about everyone and where you all reside and what you have done to make a living. People in themselves are extremely interesting and fun to get to know. Since beginning these writings, I too have learned much as well. I feel that when we stop learning is when we stop being an active member in life itself. I would like to express my Thanks to all of you folks that have taken the time to personally comment on all of the bloggers area's. It helps us to determine what is of value to you ,the readers. You are the most important factor in all that this site has to offer. Simply the deversification of the site speaks volumns. A great many of these blogs, including this one, is well worth the printing and saving for reference blogs. Am I gushing too much? Well, don't worry, I can continue, because I think you all are worth it. I know when you use the metallics and the holfil thread, you should have the thread in an upright position, the thread does not get tangled as much and you should sew at a considerably slower speed, including MEing. Here is the question. When you have the spool on the machine, it lies sideways and therefor is twisting, therefor more inclined to knot, now if you have it on a thread pilot, or any other thread stand, where the spool is upright, you still have to go through the thread guides, which is above the thread, and therefor taking the same turns. So, what is the difference? Both are essentially taking it off of the top, it is just the spool is up or down.